PH 4.5/3.5 Glass Table is a member of the PH 3-shade family, and the principle behind the PH 3-shade fixture was made in a few hectic months in the winter of 1925-26 for a large exhibition hall in Copenhagen, Denmark called “Forum”. This is what PH said about his new fixture in 1926: “The real innovation in the PH-fixture is that it produces lighting which is both glare free and economical. It is easy enough to create glare-free light (indirect and strongly shaded light) if a portion of the light is allowed to be wasted, and it is equally easy to make fixtures which are highly efficient if you ignore the fact that they severely irritate the eye (strong specular reflection, etc.) but it is an art to make light both economical and glare free.” When Poul Henningsen designed the fixtures for the World Expo, he had already been playing with the idea that the logarithmic spiral was perhaps a suitable basis for a new shade structure. 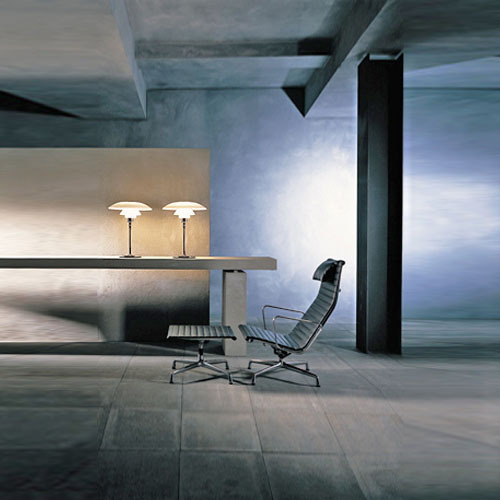 The combination of diffused reflection and a logarithmic shade curve also gave PH the opportunity to control the fixture’s glare and shading, as each shade would evenly decrease the amount of light emitted according to their distance from the bulb. The luminance transitions from shade to shade would also appear harmonic. The relative size of the shades and their positioning was determined by the need to reduce glare - the light disposition on the shades and the light distribution demands - according to some remarkably simple principles. The PH4.5/3.5 glass table lamp base is available in high luster chrome plated or black chrome plated, brass. The lamp shades are in handblown white opal glass with a top plate in high luster chrome plated or black chrome plated, spun brass. 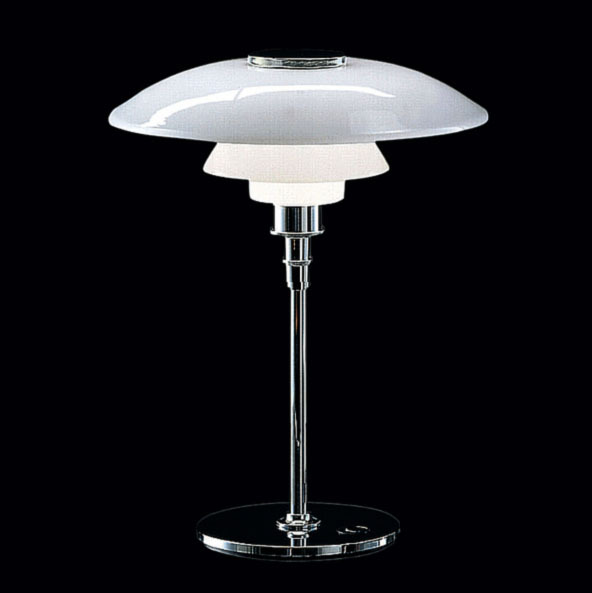 The lamp stem is in a high luster chrome plated or black chrome plated, brass as well. The cord is black with a of length: 9', and the on/off switch is in-line.